Frost’s History of Clare tells us that the name Ruan comes from the old Irish name for the Aldar tree, Ruadhan. The bark of the alder was used in olden times to dye wool red. Writing in 1807 Samuel Lewis tells us that Ruan was the site of one of the principal sheep fairs in the county. This fair was held on September 26th and a fair was also held on June 17th. Until the early 1960s the school was closed on these days but by then the opening of Ennis Mart had put an end to fairs. Frost’s History also tells us that the MacBrody family, who were hereditary poets and historians to the O’Brien’s of Thomond, were associated with our parish. They had land in Ballybrody, Lettermoylan and Kilkee which they held free of all tribute by virtue of their office as Chroniclers of Kings. The Macbrody family lost all their property during the Cromwellian wars. Bishop Fogarty aluded to this proud history when urging the people of Ruan to build a new church even though finance was a problem. The next church was Teampeall na Raha in Ballymacrogan. This church had a school associated with it but there is no trace of either building now. A thatched church was later built on the site where the priest’s house now stands. Ciaran O’Murchadha in his book “The Diocese of Killaloe” tells us that the church building was there in 1786 because of a report from that year which reveals parishioners crowding into it to take illegal Whiteboy Oaths, against the objections of the clergy. The Whiteboys, also known as Terry Alts or Ribbonmen, were a rural protest movement of the early 19th century. (The priest at that time lived beside where Gerard O’Halloran’s house is now but that house burned down in the 1930s). The thatched church was slated in about 1834 but by the early 1900s Bishop Fogarty said he understood “the loving tenacity with which you have clung to the old church until its worm eaten rafters were almost about your heads”. He went on to say that he “tried all the architects skills to have it repaired, but in vain” so he gave his consent to have it replaced by a new one. A part of the original chimney from this old church is now in Fr. O’Neill’s possession. The remains of Fr. Constance Curtin who died in 1845 and was buried beside the old thatched church were exhumed and reinterred in the priests’ burial ground in the new church. Fr. Garry was born in Shannahea near Kildysart around 1856. He was ordained the year that Michael Davitt started the Land League (1878) and one of the first Land League meetings in Clare was held in Inagh when he was curate there. His last public function was an address to the tenants of the Crowe estate in Dromore. He was very ill at the time and the weather was cold and wet but the Clare Champion of 2nd November 1912 tells us of “the indignant and scornful manner in which he denounced the conduct of the authorities to the police inspector” and of his speech “full of fatherly and Christian advice, a speech full of hope and promise of success”. When he died telegrams of sympathy were sent to his brother by M.P.s John and Willie Redmond. The Clare Champion also notes that Thos. Crowe, Dromore and his son, attended his funeral as did Sir. Michael O’Loughlin (Sir Michael O’Loughlin, who was the 1st Catholic Master of the Rolls and whose mausoleum is in Ruan graveyard is also commemorated by a statue in Ennis Court House). From letters in the diocesan archive it would appear that the site of the new church was a cause of some controversy in the parish. Bishop Fogarty alluded to this when he spoke at the blessing of the foundation and said “the churches are build and maintained by the people themselves. Every stone in them is their gift to God. In this ancient village they made an additional offering to God of their naturally strong feelings on the subject and cheerfully abided by the decision”. The Bishop went on to thank Mr. and Mrs.Mellett who “with extreme generosity and goodness presented the parish with the beautiful site on which your new church is now being built. Mrs.Mellet (formerly Gertrude Mathew of Rinroe) was a grandniece of Fr. Theobald Mathew, the Apostle of Temperance. In 1907 the total cost of the building was estimated at £2,500, less altar and baptistery. The architect was Mr. O’Malley of 10 Glentworth Street, Limerick and the builders were Mr. Harry Keller and Mr. William McInerney, both of Kilrush. Fr. Garry had about £1,000 in hand because of legacies left to the parish by Mrs.McGuane and Mr. Jeremiah Kelly (see figs.2 & 3). The bishop himself gave £100 and Fr. Garry said he “will build the church in honour of the Blessed Virgin and she will find the money”. Bishop Fogarty urged the people of the parish to contribute what they could in the following words: “there is hardly a stone in a modern Irish chapel that is not put there by the hand or the pennies and shillings of the people themselves. I venture to say that when your new church here is finished it will be true to say that there is not a family in the parish that did not contribute its own share either by voluntary labour or assistance in money”. There was a debt of £400 when the church was dedicated in 1911. In 1912 a letter from Fr. M.McGrath to the bishop states that Mr. Henry Keller had agreed to put up wainscoting and altar rails at a price of £31 each. He told the congregation that the first church we read about in sacred literature consisted of one stone, erected by Jacob saying “and this stone which I here set up for a title shall be called the House of God”. 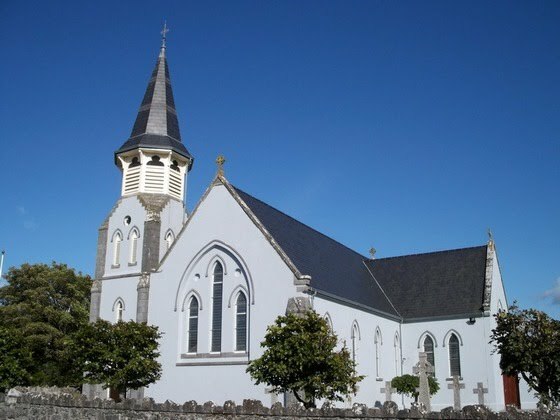 He appealed to the people of Ruan and their friends and neighbours to “show their devotion to God’s house by contributing to wipe off the debt that still remains due on this sacred edifice.” He concluded by saying that canon law requires that every church be called a name and the name of the new church would be St. Mary’s of Ruan. Bishop Fogarty spoke at the end of Mass and thanked and prayed for the families whose donations had made the building possible. The people of the parish had not only given of their money alone but of their time and labour in building it. He expressed his sorrow that Fr. Garry could not be there because of illness. The altar from the old church was in use in the new church when Most Rev. Patrick Clune, Archbishop of Perth and a native of Aughrim, Ruan visited his native parish in 1913. He donated a new altar from Early & Co. in Dublin at a cost of £250 (see fig.4). The Clare Champion of March 20th, 1915 tells us that on St. Patrick’s Day the new altar was consecrated. The altar is described as “striking and beautiful” and the Tabernacle as “exceedingly ornate of a very beautiful design. In his sermon Bishop Fogarty explained that the first Christian altars were made of wood but stone was now the standard matter for altars. One reason for this is symbolic and the other is historical. The symbolic one is that the altar is to the church what the rock of Moses was to the people of God in the desert, the source of living waters. The historical reason is that when the early Christians were in the Catacombs Mass was said on the stone slabs covering a martyr’s tomb. Since very early in the life of the Christian church it has been a fixed and unchangeable law that every altar must be made of stone and have inserted in it at its consecration the relics of some Christian martyr. The relics in the altar of St. Mary’s are of St. Celsus and St. Florentiana. By now the debt on the church was £70 so the Bishop suggested that there were two more things to be done. First was to put on a porch to keep out the draught and act as a baptistery and second, to start a “copper collection” every Sunday for the upkeep of the church. The porches and spire were added on shortly after the consecration of the altar. When digging the foundation for one of the porches the workers came across the cave which reputedly goes from Porte Hill to Lissyline forte. The porches were built by Mr. Paddy Casey, uncle of the O’Connor family of Attytirilla. The trowel used in laying the foundation stone is still in the possession of Jerry O’Connor. Big changes were made in the late 1960s after the second Vatican Council when the Mass was no longer said in Latin and the priest faced the people, instead of having his back to them. The altar table was moved forward and the altar rails removed in line with the new regulations. The reredos were made of caen stone that shattered when disturbed but there was enough marble left over to make the lecturn and the priest’s seat. Central heating was also installed around this time. In the mid 1990s major renovations were carried out on the exterior and interior of the church and the stained glass windows behind the altar were replaced. The work was carried out by local contractors O’Connor & Egan. In the late 1990s a second sacristy and toilets were added by the Ruan FAS group, under the supervision of Mr. Morty Kelly. The FAS group continues to maintain the church grounds and graveyards. At this time also new stained glass windows were installed behind the altar. The windows came from St. Xavier’s Chapel in Ennis, Convent of Mercy, which is now the Temple Gate Hotel. The windows transfer to Ruan came about when the Sisters of Mercy closed down their old convent and moved to new accommodation at Friars Walk. The windows were made by the famous Mayers & Co. of Munich. The Munich studios were bombed by the Allies during the Second World War, destroying all the order books, the names of the artists and the details of the commissions. The studios did not reopen with the result that these windows are irreplaceable today. Mayer windows were competitively priced because of the sheer size of the studios. For this reason they were popular in Ireland at the end of the 19th century. In her book “Sisters of Mercy of Ennis”, Sister Pius O’Brien tells us that in the early days of the Sisters of Mercy in Ennis three Ruan girls joined the community. They were three Lingard sisters, two of whom joined in 1859 and one in 1865. In April 1872 one of the Lingards, Sr. Ignatious was a member of a group of 11 nuns who left for Connecticut at the request of Bishop McFarland of Hartford. The following September the sisters opened schools in Meriden and Middletown. In October of 1872 Sr. Ignatious was joined by her sister, Sr de Pazzi Lingard. At the dedication of the church in 1911 Bishop Fogarty spoke of the need for a baptistry. This was taken care of in 1916 when Canon Flannery VG donated a baptismal font. The font was in the porch at the right hand side (men's side) and was enclosed behind a railing and gate. The font was placed in its present position with the other Vatican Council changes. When the curate in Ruan, Fr Liam Leamy, died at a young age in 1960 a brass gate was erected in his memory replacing the timber gate in the altar rails. When the rails were taken away the gate was put in front of the candelabra. This is a fitting time to remember and pray for all the people, who down through the years gave willingly and freely of their time, labour, money and talents to help in the church and in all the activities that go on in the parish. The range of activities is so wide that any list would surely omit somebody. We pray that God will reward all those who give so generously of themselves. "Through the hands of such as these God speaks and from behind their eyes He smiles upon the earth." John & Nancy Kirwan served as sacristans from 1944 until 1994. In recognition of their work for the church, on May 10th 1994, they were presented with the Bene Merenti medal by Fr. Tom Burke. The Bene Merenti Medal was instituted by Pope Gregory XVI in 1832 and is conferred on those who have exhibited long and exceptional service to the Catholic Church. Left to right: Gerard Maher, Mary Morgan, Flan Lyons, Emer O’Halloran, Mary Marrinan, Fr. Pat. O’Neill, Mary O’Halloran, Linda Hogan, John Mulqueen, Edel Bluett, Tommy Kelly, Anthony McCarthy & John O’Sullivan. (missing from picture: Seanie Clohessy, Anne Foley, William Lynch, Caroline Meaney and Eileen Roughan).